Bali is a fabulous holiday destination for families, whether you’re travelling with young children or teenagers, and there are countless accommodation options designed specifically to suit the needs of travelling families. Whether you’re looking for an all-inclusive resort, a villa with plenty of space for privacy, or a hotel offering day-care services so you and your partner can enjoy a romantic evening out, there is no shortage of affordable and high-end family-friendly hotels options in Bali. Here are just a few of our favourites. Located just steps away from Jimbaran Bay which is famous for its fresh seafood restaurants, Le Meridien has won multiple awards including the crown for Southern Asia’s Luxury Contemporary Hotel in 2016 by World Luxury Hotel Awards (which is basically the Oscars of the hotel industry). Le Meridien is a world-class super-resort, offering rooms, suites, private villas and penthouses to suit all requirements and budgets. There’s a saltwater lagoon, full fitness centre, day spa, multiple restaurants and best of all, the Kids Club, which is a paradise for children filled with engaging programs, cultural education and outdoor activities designed especially for the youngsters. RedDoor is a luxury villa in Canggu, the ideal choice for sophisticated families seeking a more elegant Balinese holiday. 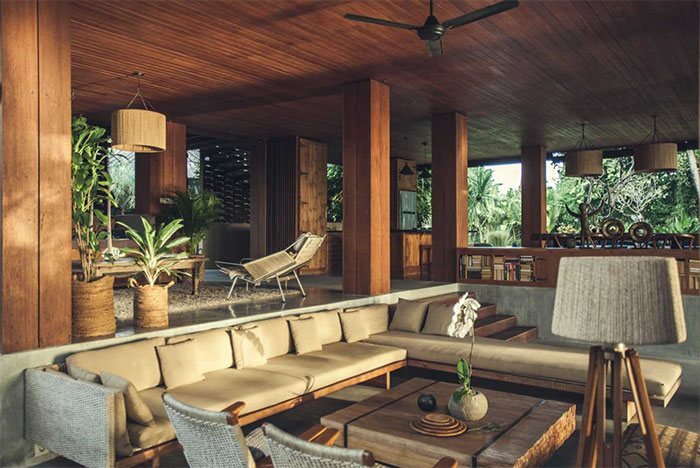 This is where traditional Balinese style meets contemporary design, offering your own four-bedroom, eco-chic villa with fully equipped kitchen, dining area and open plan living spaces. The gardens were intricately designed by award-winning landscape architect John Pettigrew, providing a private sanctuary under a canopy of coconut trees where your family will enjoy a tranquil, relaxing stay. You’ll be treated to delectable dinners prepared by your own personal cook, while guests wanting to prepare their own meals have full access to RedDoor’s organic vegetable and herb garden. Staff will help you entertain your children by planning fun activities on the villa grounds or in nearby destinations, and can provide everything from strollers to babysitting services. Looking for an all-inclusive five-star resort with its own private beach located just 25 minutes from Ngurah Rai International Airport? Check out Grand Mirage on the tip of the spectacular Nusa Dua Beach, which offers over 300 rooms, suites and villas, eights bars and restaurants, and kid-friendly swimming pools complete with waterslides and fountains. The Gold All Inclusive Package is perfect for those on a strict budget as it includes unlimited food, beverages, water sports, activities, airport transfers, room service, mini-bar and cultural performances. Babysitting services are available, and the Bamboo Kid’s Fun Club offers an outdoor and indoor playground, games room, boxing ring, mini waterpark and daily activities. If you want to give your family a hotel stay they’ll never forget, look no further than the Elephant Safari Park & Lodge, winner of Bali’s Most Unique Hotel and Best Eco Lodge in the 2017 World Luxury Hotel Awards. This awe-inspiring hotel provides guests with the once-in-a-lifetime opportunity to interact with Bali’s largest herd of rescued Sumatran elephants, all while staying in an exquisitely designed luxury eco-lodge. 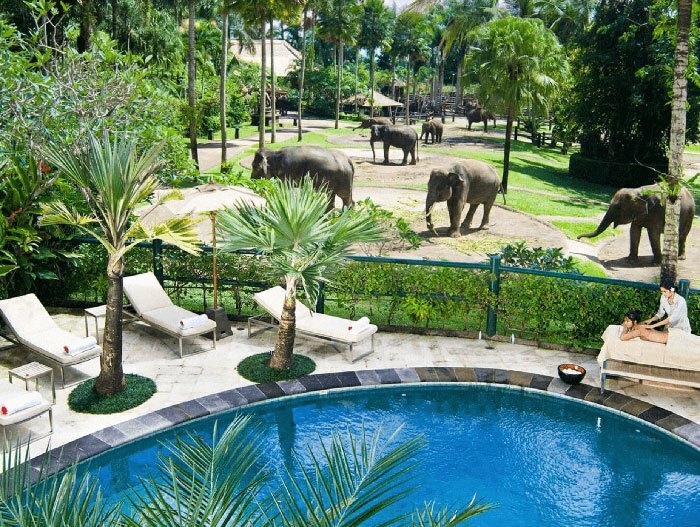 You can hop onto an elephant straight from your doorstep and head out into the lush surrounding jungle, lie by the pool as you watch the elephants go about their daily lives, or even help bathe one of these majestic beasts. The lodge itself is surrounded by beautiful botanic gardens and vibrant greenery, providing a breathtaking backdrop for many happy family memories. If ever there was a hotel designed with the family-friendly holiday in mind, it’s Bali Dynasty. This integrated beachside resort is in South Kuta, right in the heart of Kuta’s major tourist centre, with shopping malls, restaurants, and Waterbom Park all within walking distance. The ideal choice for a hassle-free holiday where all activities lie at your doorstep, Bali Dynasty offers six restaurants, five bars, three swimming pools (including kids pool with waterslide and Water Fun Zone, and a dedicated adults-only pool), spa, fitness centre, playground and much more. Teenagers will love The Den, exclusive for ages 10 to 16, while the Kupu-Kupu Kiddies’ Club is renowned as one of the best kids’ clubs in Bali. Bali Dynasty may not provide the most cultural experience, but it sure offers everything you will ever need all within the one secure location.